A major news event in the United States a few weeks ago was the shooting of Michael Brown by a police officer in Ferguson, Missouri. The incident has sparked outrage across the country on the use of police force and racism (as well as ongoing rioting in the town of Ferguson). I do not pay enough attention to news events like this to have any opinion on the matter, but I came across the following infographic this week which I thought was shocking. --- Hey, we live in one of the ONLY countries in the WORLD whose citizens have the RIGHT to own and bear arms just about anywhere. With that is obviously going to come more firearms related crime and thus police related shootings. 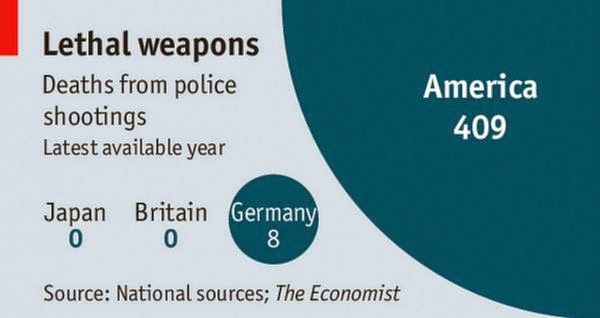 In the US currently police kill about 600 people each year. That is actually a very low number when you consider that just about anyone can own and bear a gun. There are 321,000,000 people in the USA and only about 600 police shooting deaths. That is only about 1 shooting for every 500,000 people annually! Now any deaths are too many deaths, but that number is very low considering the facts. I give the cops props for not shooting a lot more of those people who brandish firearms and use them criminally.